Austin Air Purifiers are great at removing 99% of tiny particles from your indoor air. 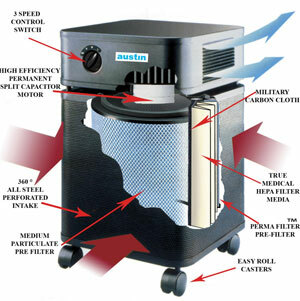 Austin Air purifiers have a 360 multilayer filter that trap unwanted particles at many levels. They remove allergens, dust, chemicals, odor and smoke using HEPA and Carbon filters. Try an Austin Air Purifier today risk-free and see how fresh your air can be.